I am making soup as part of our regular meals these days. First reason, it is easy to make, secondly it fills up good with a good side of toast or any good home-made bread. 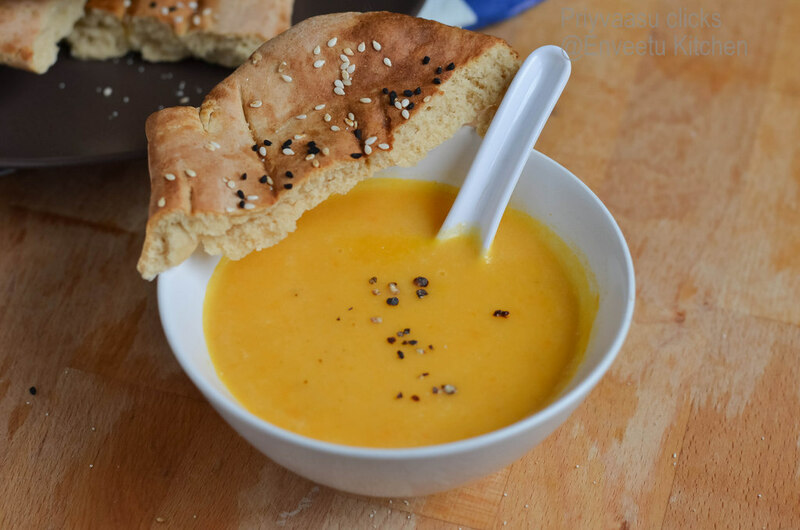 Last week i made a variety of naans as part of Blogging Marathon, to pair along i made a soup everyday. 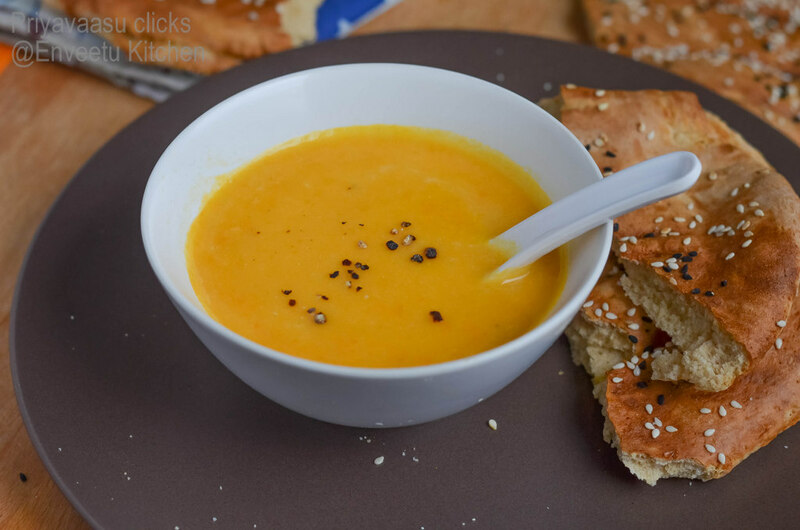 I made this creamy soup to pair along with the naan-e-barbari(flat-bread). The boys enjoyed both the soup and the bread. Heat a tbsp of butter in a pressure pan, add chopped onions and garlic and saute until onions turn pink. Next add cubed potatoes, carrots and celery. Saute for a minute or two and add 2 cups of water/stock, salt and paav bhaji masala. Mix well and pressure cook for 4-5 whistles. Once the pressure is down, blend the mixture using a hand blender, add extra water/milk to thin down the soup. I added a cup of milk to the soup. Heat the. soup for 8 minutes in a medium flame. Take it off the heat, serve hot garnished with freshly ground pepper. I served along with naan-e-barbari for dinner. This goes to Cooking from Cookbook Challenge, a weekly event happening @ +srivalli jetti's space. A bowl of this warm soup is quite enough for me to enjoy thoroughly rite now for my dinner, comforting definitely. The bowl looks amazing priya..very lovely! That is a healthy and colorful soup. Like the flavoring ingredients, Priya.